Sam spent the whole summer under the cut bank, watching scores of fishermen come and go even while he grew steadily larger on the rich diet served by the stream. He looked on with amusement as anglers tried to solve the tricky current and somehow get their flies under the cut bank. Most failed, but Sam was contemptuous even of the few who succeeded. He remembered when he was human he’d always wondered if a trout could see the hook hanging down from the body of an artificial fly. Now, as a trout, he knew the answer; the hook was plainly visible. Nevertheless, smaller trout regularly managed to hook themselves and get caught, and Sam understood it was because they had never seen hooks before and didn’t recognize them as a threat. Only after having been caught and released a few times did other trout grow wary of flies with hooks—and not all trout were released after being caught. Sam recognized some anglers as fishermen he had known and fished with during his human life. It was a weird feeling to know that now they were fishing for him! He longed to reach out to them, to communicate with them somehow, but although he could sometimes see through the transparent meniscus that marked the boundary between water and air, that thin barrier also prevented any communication between the world Sam now inhabited and the world he had left. One fisherman he recognized easily was Frank Vincent, his old friend and fishing partner who had been at his bedside when Sam died. He had always admired Frank’s fly-fishing abilities, but now, seeing him from the perspective of a trout, he was somewhat critical of his technique. To be sure, Frank still caught his share of gullible smaller trout—which he always released—but his flies didn’t look as good from under water as they had from above, and his presentations were too transparent to fool Sam for a moment. Still, he watched Frank with affection, remembering his friendship, the many afternoons they had spent together along this very stream, fishing and talking or just resting on the bank and watching the unfolding saga of the river’s life. He also fondly remembered evenings at Frank’s home, the pair of them tying flies, sipping bourbon, chewing the fat, or enjoying the antics of Frank’s unusual pets, a pair of chipmunks he’d named Ferdinand and Isabella, for reasons known only to him. Another fisherman he recognized was Miles Anthony. His profile was distinctive because he always wore a pith helmet, shorts, and a vaguely military shirt with shoulder straps and flap pockets. He always waded wet, without waders, displaying a pair of scrawny, hairy legs with prominent purple veins. His posture was that of a West Point cadet, which rumor had it he once had been, although nobody knew for sure and Miles wasn’t telling. As a fly fisher, he was the staunchest of traditionalists, fishing only a dry fly and casting only upstream to rising trout, as if he had learned the sport directly from the great Halford. More than once Sam had been treated to close-up views of Miles’ scrawny legs while he spent long minutes casting upstream to rises beyond Sam’s vision. The unflattering view prompted Sam to consider biting one of his legs, but he finally dismissed the idea as potentially dangerous, both for himself and Miles. Instead, he merely sidled farther back into the darkness under the bank and waited for Miles to run out of rises and move upstream. Owen Fenner was another angler Sam recognized. He was easy to identify because his height barely exceeded five feet. Somehow he had obtained a waiver from the Navy’s minimum height requirement and had a long career as an officer, a good one by all accounts. An easygoing man, he was fond of joking that he had been forced to retire from the Navy because his sleeves were too short to accommodate any more gold stripes. His angling companions gently chided him about all the places his short stature prevented him from wading, but Fenner countered by pointing out it wasn’t his shadow that frightened all the trout away, because he barely had one. 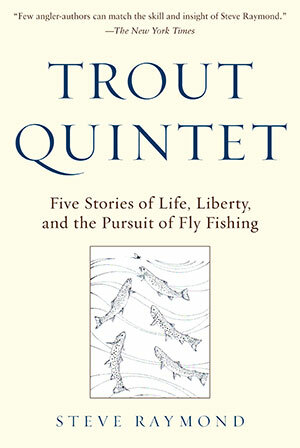 He was an efficient angler who fished with great concentration and caught perhaps more than his share of trout. Brian Barquist, fondly known to his compatriots as “Frugal,” was another Amalak regular. A rotund man well past middle age with endless energy and enthusiasm, he had spent his working life running a bookstore that sold only used books. He also claimed he had written several used books, including one titled The Frugal Fly Fisherman, the source of his nickname. There were others Sam recognized, some whose names he knew and some he didn’t. They were all part of the convivial if slightly eccentric band of anglers who shared the Amalak. And then there was Doctor Evan Hobbs.